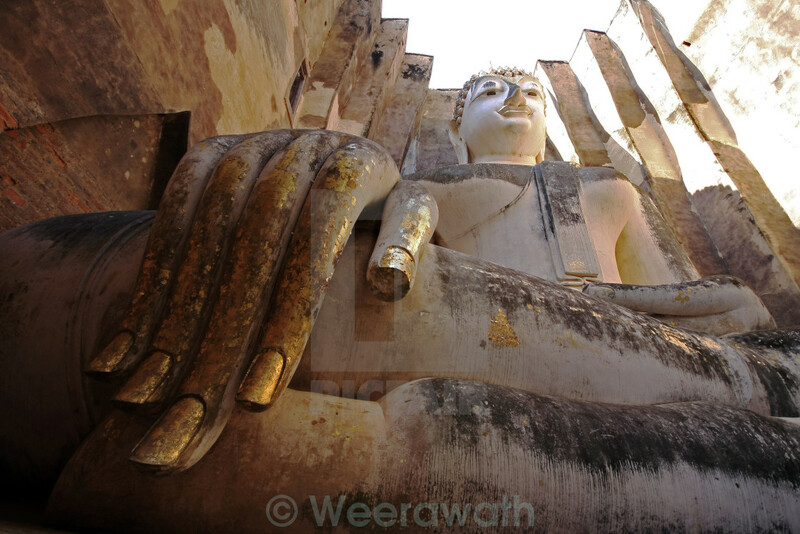 Sukhothai is one of the northern provinces of Thailand. Neighboring provinces are Phrae, Uttaradit, Phitsanulok, Kamphaeng Phet, Tak, and Lampang. Sukhothai can be translated as Dawn of Happiness. Sukhothai is one of the northern provinces of Thailand. Neighboring provinces are Phrae, Uttaradit, Phitsanulok, Kamphaeng Phet, Tak, and Lampang. Sukhothai can be translated as Dawn of Happiness. The picture was taken inside wat srichum,one of the world famouse tourist attraction heritage site of sukhothai located northern of thailand. The wide angle shoot was taken with bottom up composition let audience perceived 3 dimension atmosphere of inside the building. A beautiful afternoon sun ray casted into the building with warmth, calm, peaceful and happiness expression.